Originally built in the early 1900s as the flagship Mandel Brothers department store in Chicago, One North State Street now operates as multi-tenant offices and retail stores. The property's recent renovations offer new amenities to better serve today's tenants, and combine historic architecture with sophisticated, modern facilities. 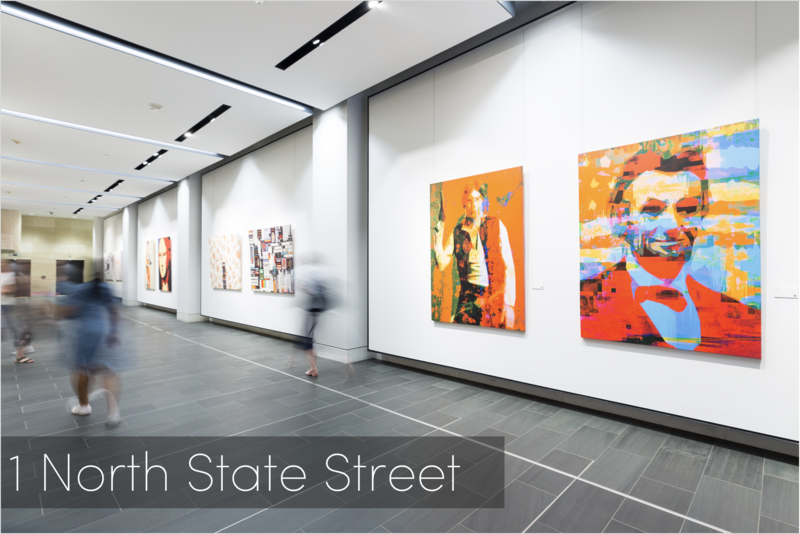 CBRE and TurningArt collaborated to bring a fresh energy to One North State's entryway space through a rotational art program. The large-scale exhibition was curated to breathe a dynamic energy into the clean and minimal space, while also offering an engaging visual story for tenants and visitors. “Because the artwork is situated in the entryway, we knew this collection had to make a strong first impression, while still complementing the industrial chic design and resonating with the tenant community. With a long, white sectioned wall as our install site, we built a gallery-style exhibition of bold, playful, and pop culture-inspired artwork. “I was referred to TurningArt as our team began the process of replacing a previous art installation that just didn't speak to the community. For the new collection, we wanted to feature local art and incorporate bold color and graphics. After our last artwork experience, the option to rotate the artwork down the road was a key advantage. Mari provided us with a group of artists whose work successfully captured the atmosphere we envisioned and the process ran seamlessly. To complement the installation, their team custom-designed collection brochures, available at the front desk for tenants and visitors to learn more about the exhibit.